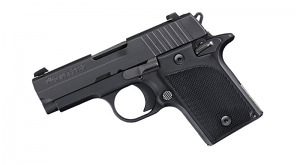 Slightly larger than the P238, the Sig Sauer P938 Nitron 9mm is chambered in 9mm and has a standard capacity of 6+1 rounds. Single Action Only, with an ambidextrous external thumb safety, the P938 is a very accurate pistol, much like the 1911 platform handguns, except much smaller! Easy concealment, 9mm, all metal construction. I finally got to the range to run 200 rounds through this pistol. I enjoyed it very much as the gun was very accurate at self defense distance. This gun is very well made ,and I had no problems at all with it. This gun paired with a VedderIWB holster will be my new carry gun. Nice gun in the 1911 style. I like the size, feel, weight and concealability of the P938. Somewhat difficult to takedown and reassemble, but over time that will become easier.